Daniel in Brookline: Is Arafat Dying? Well, I certainly hope so!! There are numerous, conflicting reports on Arafat's status, as you'd expect; he won't relinquish control until he absolutely has to (i.e. upon his death). As with other tyrants in history, it's not about "his people"; it's all about him, always. Personally, I think Yasser Arafat stands as a damn good counterexample to a famous epigram of Lincoln's. 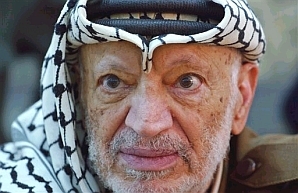 Arafat has managed to fool nearly all the people, nearly all the time, for the past thirty years. He fooled Israel into believing he could be tamed, just long enough to give him a foothold when the grounds were shifting under him. He's fooled various American presidents over the years, off and on, and cajoled them into giving him money and supplies; as always, the money that wasn't used to kill people went right into his pockets. He's fooled the Europeans, continuously, into believing he was a "rational politician" they could deal with; they continue to be dazzled by him today. And always, he has fooled the eternally gullible United Nations. It's easy to discount this ancient fraud, this man who was never what he claimed to be and never did anything for those he claimed to be fighting for. Just remember that he's held the reins of power since 1968. He's outlasted eight U.S. Presidents; he's outlived every national ruler in the Mideast, bar none. He's a survivor, who never cared how many bodies he needed to climb, so long as he remained on top. And never forget the blood on his hands. The many, many deaths caused by terrorist organizations he ran, or lent support to. Since his return to Ramallah in 1994, he is directly responsible for torturing and killing a great many of his own people. Do not discount this man, no matter how clownish his ugly face or his semi-illiterate public ravings. He has survived, by stealth and cunning and deceit and casual murder, and effectively kept an entire people -- his people! -- enslaved by a culture of hate. He has built a vast wasteland of political chaos, barely held together by his grip, making civil war all but inevitable when he dies. Nonetheless, I'll raise a toast when he does. This man has been a waste of breathing air for far too long.